IT WAS FIFTY YEARS AGO TODAY- SATURDAY JANUARY 18, 1969- D.C. STADIUM RENAMED ROBERT F. KENNEDY MEMORIAL STADIUM- IN WASHINGTON, D.C. It was fifty years ago today- District of Columbia Stadium- the home of the Washington Redskins and Washington Senators at the time- had its named changed to Robert F. Kennedy Memorial Stadium. It was in the last days of the Johnson administration that Secretary of the Interior Stewart Udall made the announcement that the stadium would be named in honor of the slain US Senator/ Presidential candidate who was assassinated the previous June. The stadium was the first of the infamous cookie-cutter stadiums that would host both baseball and football games that sprung up in the 1960’s and early 1970’s. The Washington Senators would play there until they left for Texas in 1972. 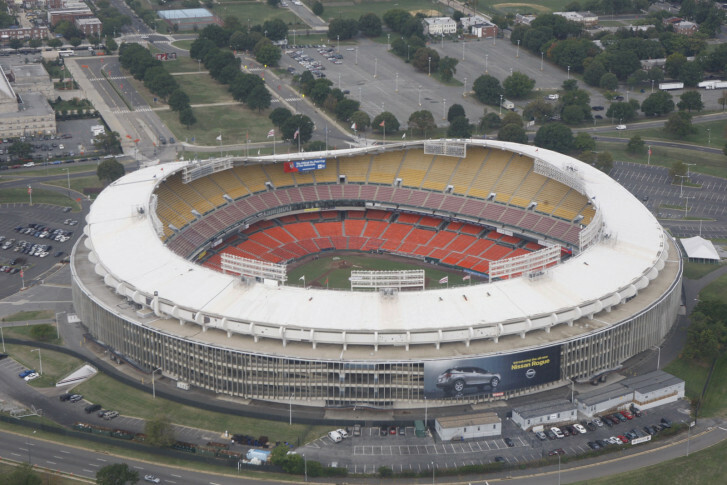 The NFL’s Washington Redskins would play there but leave for a new stadium after 1996. When the Montreal Expos relocated to Washington they played at RFK from 2005-2007 as they waited for their new ballpark to be build. D.C. United a Major League Soccer team played there until 2017 when they moved to a new stadium. Yes there is talk of demolishing it and building a new football stadium there since current one is way out in suburbs. But of course Dan Snyder would be involved plus FedEx Field where they now play isn’t that old. Been there a few times for Skins games and also to see Springsteen during the BUSA tour.